Organizing computer files in a logical way is a vital step in running your home jewelry making business. Just as you may need to access documents from your filing cabinet at a moment's notice, there will be times when you are on the phone with a customer and will need to pull up an invoice or product information on your computer. When you are in a rush to whip together a show application there is nothing more frustrating than clicking through photo after photo when all your photos are labelled with only numbers and dates. When organizing computer files, you should ideally be able to locate a file in a matter of seconds, otherwise, it is no less frustrating than having twenty pairs of socks yet not a two will match. We need to set up a system that offers both easy access to your files and a fool-proof simplicity for backing up those files. I am going to suggest two ways of setting up your files and both of them are easy to follow. After falling behind on my file keeping I recently had the unfortunate experience of loosing a large chunk of my computer data. This stressful event literally left me with a pain in my neck and prompted me to re-think my methods (or lack thereof) for organizing computer files. I love having most often used files right on the desktop, but when you are racing against the clock to back up the all important files, while your hard drive is suddenly dying in front of your very eyes, it's important to know what you are backing up! I am pretty handy with the computer, but by no means am I technically inclined. Many of my files on the desktop, as is typical, are short cuts. While most people know not to back up a file from the short cut I am going to spell it out. Don't back up from the short cut! When that hard drive has taken its last breath after two long years on this planet and gets replaced by a younger more vibrant model, the new model cannot make heads or tails out of that short cut back up file. In other words, your new hard drive will look for the original to the short cut and guess what? It's not there! So...after losing several years of my accounting data and facing a mountain of work to re-enter sales and expenses, I have gone inward and have decided to write about organizing computer files to help you..and me. Before my hard drive died I had backed up some files on a CD, a USB stick and through an online service. Unfortunately the accounting files on the CD were saved from the short cut and USB flash drive was mysteriously missing files. As for the online back up, I had not directed which files were to be saved and the files that where recovered were random...no accounting files. My computer guy did the best to retrieve data from the old hard drive, but to no avail. Lucky for me my brother-in-law did manage to save a book I was writing, my invoices and my jewelry catalogs. My misery will be your success and everything happens for a reason. First I would like to look at the two options for setting up files. I still really like to have my important files on the desktop. The question is whether to put the original file on the desktop or the shortcut. While some people advise not to store files on the desktop for various reasons such as loss due to human error or technical failure, I still choose to do so. If you feel these are of great concern then do not store files on the desktop. After having experienced a loss of important data I simply opt to take greater precautions in terms of backing up. OPTION 1: Option one for organizing computer files is to have a few select files, perhaps five, that will be directly set up on the desktop. These files should be backed up on a weekly basis and perhaps some of them more often if you find yourself adding to them daily. OPTION 2: Option two for organizing computer files is to set up the five main files in "my documents" (or the Mac equivalent) and either save the short cut of the documents to the desktop or save the short cut of each file individually to the desktop. With this system you will have to go into the original files and save them on a weekly basis or more often as needed. Now when I am organizing computer files I will categorize my files into five main areas that are stored in my documents. I will short cut each file to the desktop. Photos take up a lot of space on a computer and some people advise not to save multiple copies of the same photo. In the jewelry making business I think it's imperative to have ample space on your computer to accommodate large photo storage mainly because you will need varying degrees of resolution for different applications. I personally do not want to re-size my favorite photos over and over as I need them and therefore I prefer to have them sized and ready to go. For example, when applying for a craft show or sending out publicity shots you will need to have top notch, high resolution photographs. For websites, you will need lower resolution photos as specified by the particular website. The resolution may be lower for your own website than it may be for a marketplace site such as Etsy. When applying to shows using e-applications or by sending in a CD you will need to adjust your photo resolution to that which is specified by the show. 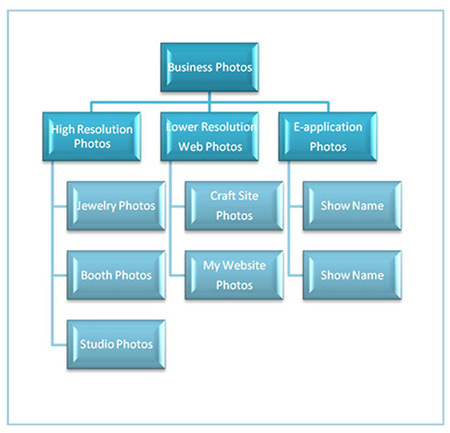 You will quickly collect a large number or photos in your jewelry making business and organizing computer files will become essential for managing photos with ease. This has probably become the most important reason for me to both write about organizing computer files as well as practice what I preach. 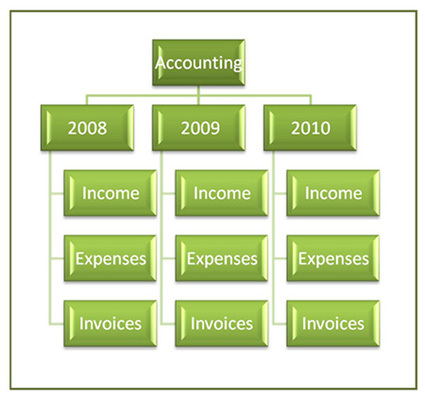 When it comes to accounting I like to set up my files by year and then subdivide those files into income, expenses and invoices...straight forward and easy to access. I am really big on making catalog sheets in Publisher. They are easy to make and easy to save as a PDF. When I have a new design I photograph it and add it to my catalog sheets. PDF files are great as they can be emailed directly to customers and saved onto a CD for mailing or handing out at wholesale shows. The layout for filing is simple. I have two main files for wholesale and retail and each is subdivided into working copies (for updating and adding) and finished PDF files. If you use a program such as Publisher or Corel Draw you will accumulate many design files for promotional material and company literature. Cards - which include business card designs, jewelry cards and info cards for customers who want to give a description card with their gift that says a little bit about how the jewelry was made and where it came from. 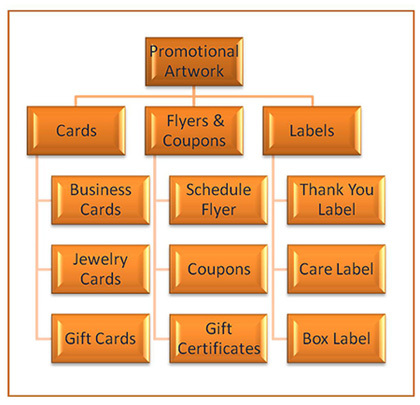 Flyers and Coupons - which includes a seasonal or annual flyer listing all the shows in which you will exhibit, promotional coupons such as: "save 10% when you visit my booth at such and such show" and gift certificates. Labels - I like to send out a thank you label with a vintage style photo of my booth with every web order that I receive. For some of my jewelry I include a care label if it requires special care and I always have a box label ready to apply to the boxes of all my website orders. I keep the original promo designs in my computer ready to print as needed. Customer Files - customer profiles, contacts and addresses, address labels. Show Files - here I keep downloads for show applications, order forms for show electrical, parking etc. and product descriptions to send with show applications. Form Sheets - included in these are personalized inventory forms, a bill payment sheet, email sign up sheet to collect an email list at shows and a fax cover sheet. 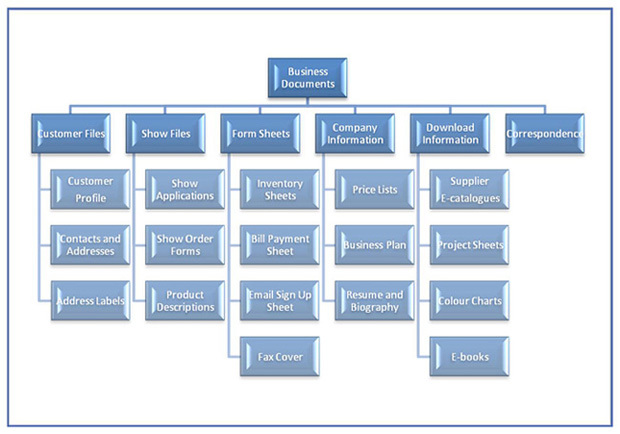 Company Info - here you can keep company information such as price lists, your business plan, your resume and biography. 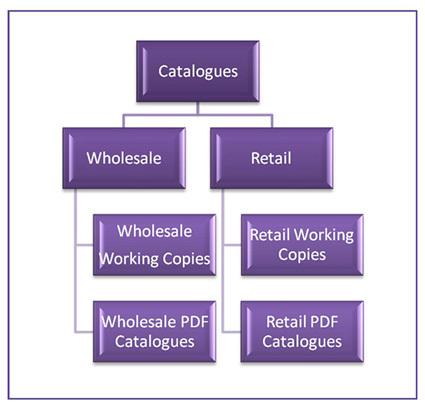 Download Info - here you might want to keep supplier e-catalogs, project sheets, color charts for crystals and the like, and e-books. Correspondence - letters to shows, the bank, customers etc. This folder will keep your business documents separate from your personal documents and make for easy access. I use all of the above for a number of reasons. First of all, it is easy to back up files onto Cd's and even easier to pop a USB flash Drive into the front of your computer if you have a port in the front. 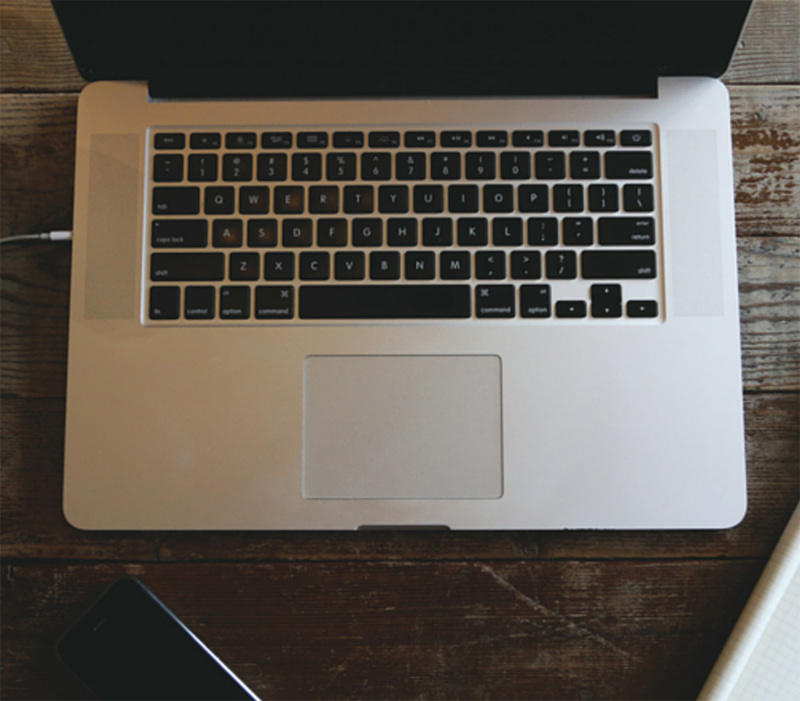 Back ups like this can be done each time you adapt or add to your important files. After loosing much of my data I purchased a 1 TB (terabyte) external hard drive which is equal to 1024 gigabytes. My hard drive is set to back up my files every Sunday night. This takes care of any issues such as hard drive failure or virus issues. Should my hard drive suddenly fail again, I should have a back up that is no older than one week. In the issue of a flood, fire or other unpleasant disasters the online storage is a good idea. Some people keep copies of back ups in a safety lock box or safe deposit box. I will be much more diligent about maintaining my files after my recent mishap... somewhere between a healthy balance of proactive cautiousness and paranoia. In short, be wise, be diligent and be organized! Organizing computer files may take a little effort in the beginning, but will save you loads of time and aggravation in the long run.